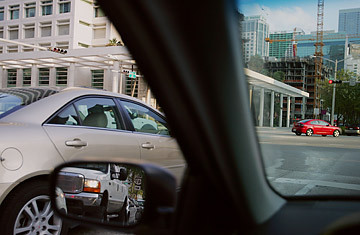 Vehicles drive through the streets of Miami, Fla.
Ashley Nicole Valdes was a smart, pretty 11-year-old girl who often cared for her younger, mentally disabled sister while their single mother studied to be a paramedic. In January, while crossing the street to get to her home west of Miami, Ashley was struck and killed by a hit-and-run driver in a pickup truck  and became a heart-wrenching symbol of South Florida's notoriously reckless car culture. "You see all these people getting run over and you ask yourself: What's happened to us as people here?" says Ashley's mother, Adonay Risete. "We need to get tougher and change attitudes." This month, highway-hugging Floridians are seeing perhaps the most convincing evidence yet that they need an attitude adjustment. A study by the nonprofit Transportation for America in Washington, D.C., lists the most dangerous metropolitan areas for pedestrians, and the worst four just happen to be in the Sunshine State: Orlando, Tampa, Miami and Jacksonville. It may seem like an astonishing find, but it's not actually all that surprising: 490 pedestrians were killed by cars in Florida last year, the most in any state, and South Florida consistently ranks as one of the worst pockets for hit-and-run fatalities. For an entire nation that has given the automobile far too much right of way, the TFA report, titled "Dangerous by Design," makes it clear that Florida is a cautionary tale. It's especially relevant during the current recession, when the U.S. is also looking to alternative transportation projects like passenger rail to help jump-start the economy. "We're not saying paralyze traffic or penalize drivers," says TFA spokesman David Goldberg. "But we have to restore some balance in this country and fix this deadly situation, especially for the health and safety of our kids and senior citizens." It's not just deadly in Florida. Each month, about 400 pedestrians are fatally cut down by cars across the U.S.  "the equivalent of a jumbo jet crash," Goldberg notes  and 76,000 have been killed that way since 1994, one of the highest pedestrian-death rates in the world. The root cause is simple: the thoughtless sprawl of modern urban and suburban development has created too much high-speed space for cars and trucks, and too little of it for walkers, cyclists and the kind of public transit that reduces dependence on cars. "Dangerous by Design" finds, for example, that less than 1.5% of federal transportation safety spending goes to pedestrian projects like increased sidewalk construction or cycling paths, even though pedestrians and cyclists account for 13% of all U.S. traffic deaths.